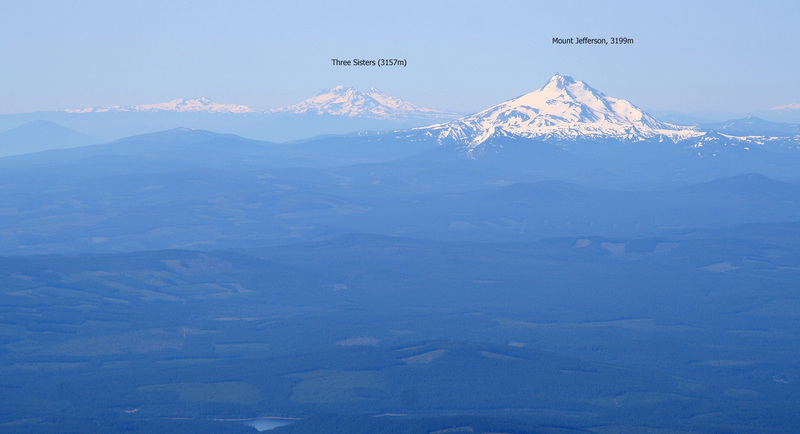 How to get there: This mountain is located in northern Oregon and Portland is the nearest city. Locate Hwy. 26, and travel eastward. This road serves a small resort area called Government Camp with lodging and restaurants. 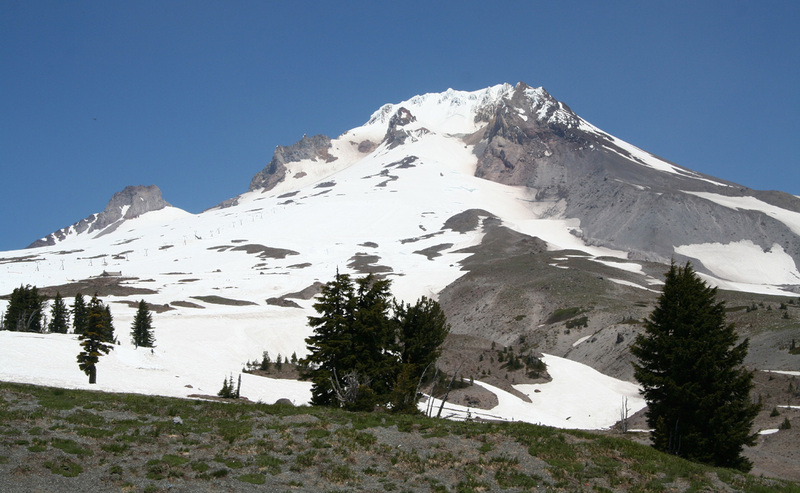 From here, the 10 kilometer mountain access road forks left and climbs to about 1800 meter where there is a single, pretty fancy lodge - Timberline Lodge. There is a large parking area as well as ski lifts that operate around the year on the lower, south slopes of the mountain. Route description: Start from the parking lot and head directly up along the east (right) side of the downhill slope. As your reach the top of the ski slope, continue straight uphill (perhaps slightly more left) in order to reach a local horizon (ridge) above. 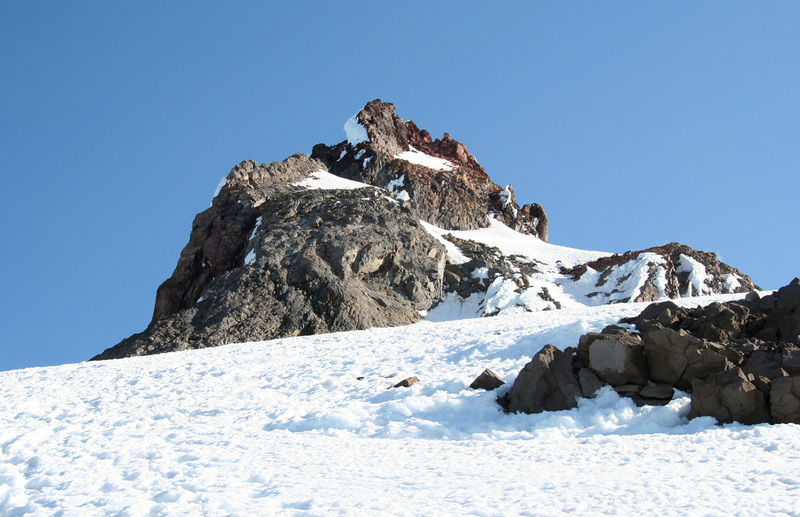 There may be a short section of (mostly flat) rock as you continue on a pretty broad ridge in order to reach a slightly steeper snow slope that extends up towards the crater. Climb this slope (your general direction turning a bit more to the right) and enter the crater keeping close to the left side rocks. 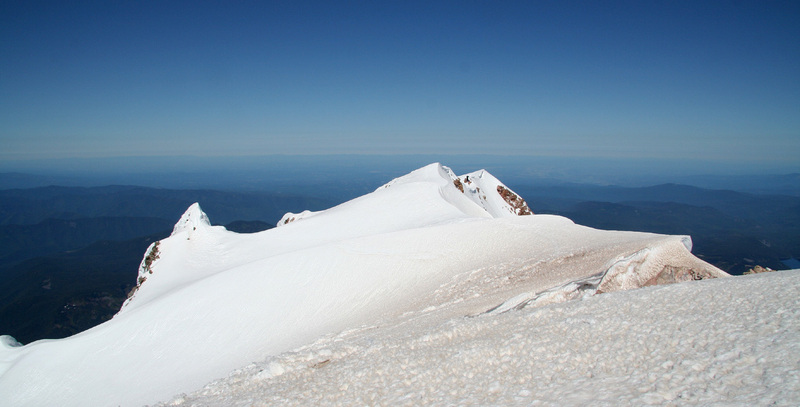 The crater is sort of divided into two parts with a more distinct snow ridge that climbs gently towards the steeper slope higher up. Climb this snow ridge, then traverse the steeper slope on your right hand side just below a distinct crevasse (bergschrund) until reaching a point where it can be crossed. 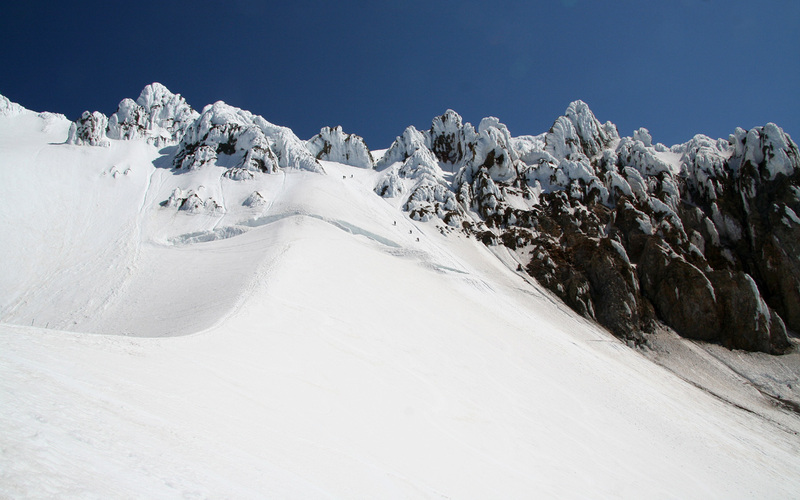 From here, the route ascends a pretty steep (45-degree) snow slope, then gains more elevation by a left-right zig-zag before entering the chute called Pearly Gate. 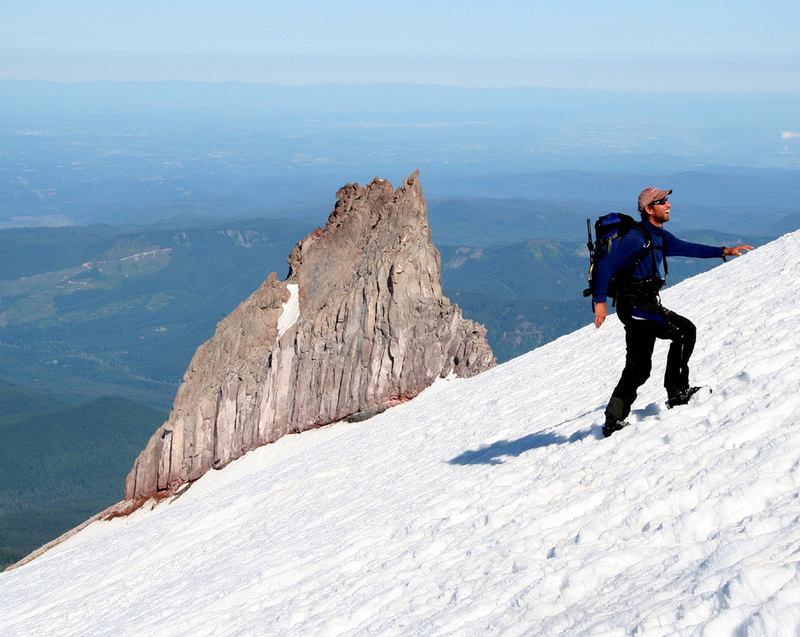 Many parties choose to protect this part of the climb with snow pickets and belayed climbing. (To climb it roped, but unprotected is dangerous as an individual fall is unlikely to be arrested by the team.) 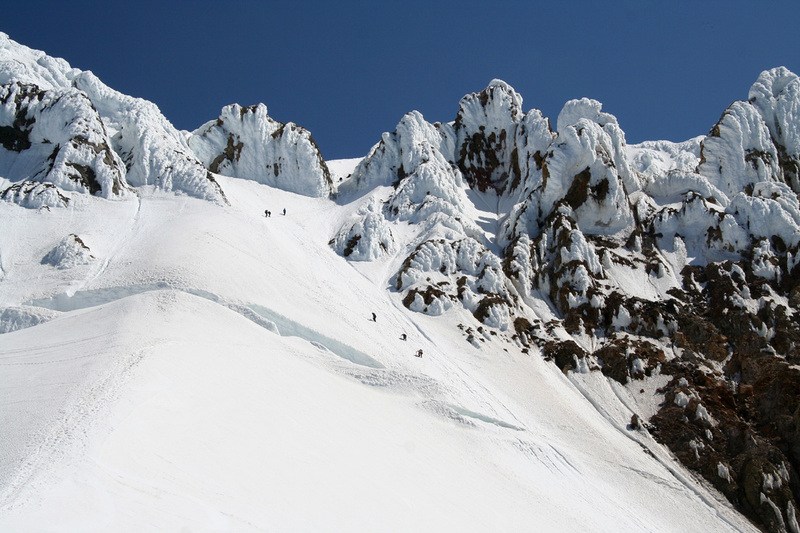 Above this chute, the terrain becomes much easier and only a short section remains before the summit is reached. One should note that the slopes above the Pearly Gate chute is full of rocks that may melt loose and fall down (in particular, the left side when viewed from below). Similarly, ice blocks could also avalanche. One should be out of this area before the sun softens the snow too much. Comments: We had the great honor of meeting Jean Aschenbrenner and Ken Nolan on the summit. They arrived shortly after us, as we passed them near the Pearly Gate (where they protected their climb on the steeper section). Jean was the first woman to complete all 636 Colorado summits exceeding 13000 feet, while Ken would be the first person to climb all 1781 Colorado peaks exceeding 11000 feet. When Olav was passing Jean, she asked if he was together with Helge and me (we were already near the summit). With an affirmative reply, she asked where we lived and upon hearing "Norway", she questioned/remarked that we were (very likely?) familiar with ice and snow conditions. We climbed this mountain at a rather good pace. Leaving the parking lot at 0630, we arrived at the summit already at 0945, an average rate of ascent exceeding 500 meter per hour (including several short rests as well as pausing for photography). We spent an enjoyable 30 minutes at the summit before descending with arrival back at the parking lot at 1200 - noon, a total trip time of 5.5 hours. Mount Hood as seen from the parking near Timberline Lodge. Mount Hood with the route indicated. Helge, a good pace up the hill. A nice day on Mount Hood. The upper part of the route. This section is steeper than it looks and caution is required. Climbers on the crux part below "Pearly Gate". 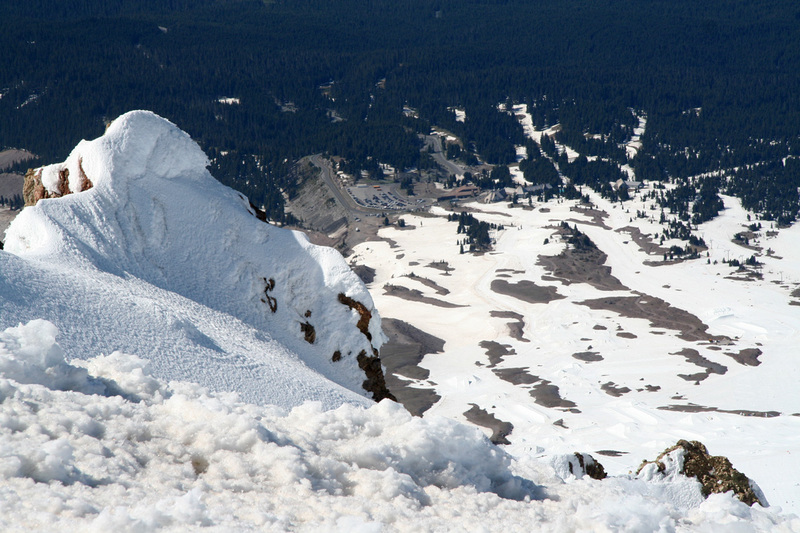 Summit view, to Timberline Lodge. 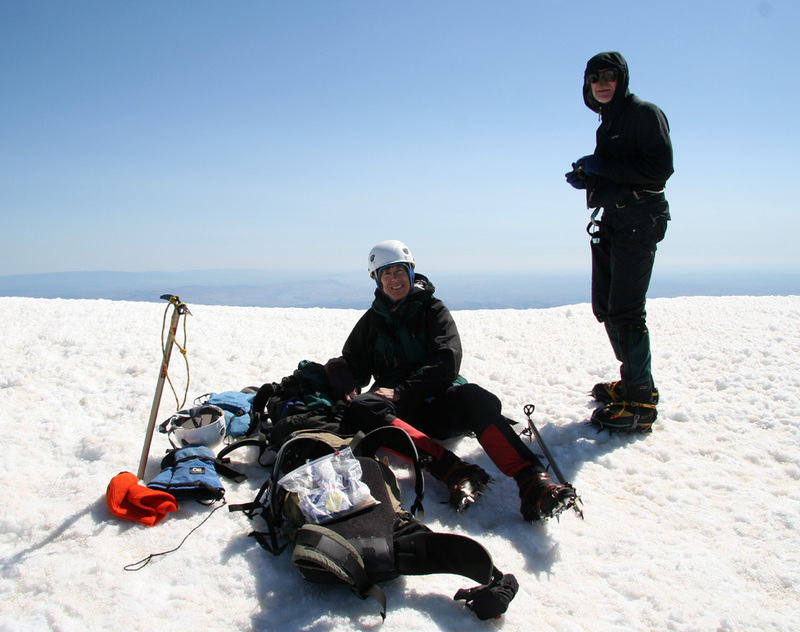 Distinguished company, Jean Aschenbrenner and Ken Nolan on the summit of Mount Hood. 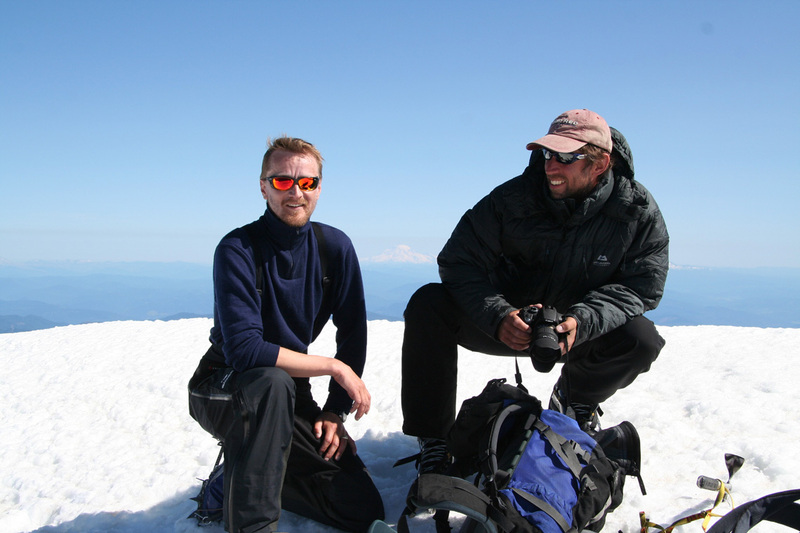 Olav and Helge on the summit.